or scared of death itself? am i astonished at you? every inch of my body which has been closest to me. ridding me of the push and pull of yesterday. will be able to escape you . am i falling in love with you? Yet every body is afraid of it, stays away from, unless your impulses overpowers it momentarily...helpless, like a puppet on a string. JAC, you are right ...undoubtedly. Great pic to go with the poem! Where did you get it from? I kinda like the prfound thought packaged in simple language. I must say I'm falling in love with your poetry! that was the most beautiful appreciation i have recieved so far for my poetry.....thanks buddy. hmm, i am surprised that someone can think so deep yet express in so simple words....... great work !! i now realise, how much i missed u n ur poetry in that break from june-aug!! i wish you can go beyond this HMMMMMM.....of yours. well if u say so i will believe it...how are you by the way? so sweeeeeet of you . where have you been buddy? i sneak into ur blog lot of times.....i hope you dont mind. 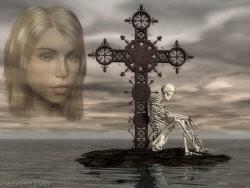 no i dont think much about death....in fact death reminds me more of this beautiful life that i dont seem to appreciate. you lie in your sleep and when you dream of the death, you wish you can run faster from clutches of death. And as you said thoughts of "death" makes you realize the importance of Life. Wow, you sure can write! Arent people usually afraid of things they dont understand? Well fear is irrational mroe often than not. Like snakes, I dont understand them..and I am terrified of them!! welcome to my blog...and you are right friend. after a long time i am seeing you on my blog. where have u been? i wish i could write like you. you too are one of my favs. thats a new twist to what i wrote. i read it . beautiful just beautiful. a sweet hello to u.and thx for tht sweet compliment. i was waiting for these few lines from you. i am sooooooo happy for u. hope life rocks for u always. normal ppl might find it very sweet actually. i'm an aberration.